I have absolutely no idea what happened in this novel. My brain has melted all over the insides of my skull, and Ness has left me, once again, in a state of utter disbelief. 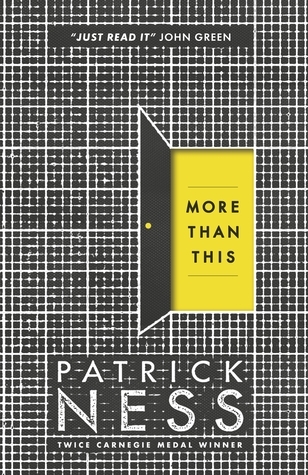 More Than This is almost 500 pages of confusion and chaos becoming ameliorated with philosophic realisation. And this book is for kids. Firstly, I just want to touch upon the fact that this book is for kids. Although, at 29 years old, I still consider myself a young adult, when I was truly the age of the target audience, I had nothing to read but empty nonsense designed purely for entertainment and for keeping us out of trouble. Yes, they had their messages - friendship, being good, staying away from vice (not that those helped me), but I never read anything with such an impact as this. Ness is a YA writer with a certain sophistication, a certain way of landing a message more important than not stealing your friend's boyfriend (sorry, Sweet Valley High, I still love you), and an out and out love and respect for his audience. They're not stupid kids; they're clever, they're fierce, and they're ready to be tried. And in true Ness fashion, try us he did. You're a reader. You've read books before; they tend to follow patterns. You know what's coming, vaguely. You've seen it before. You're comfortable in your literary cloud; it's nice. You try to tell Mr Ness you're enjoying his novel, but before you can voice the statement, he comes and smacks you over the head with a heavy plot twist. You don't have time to recover before the next one. The smacking continues until page 480. You're never the same again. You are plunged into a strange dystopian crisis with Ness throwing existential questions around at speed. Finding one answer unlocks a plethora of other questions until the realisation that none of the answers really matter triggers the above-mentioned melting of the brain. You're questioning everything. You don't know what's real. Ness has ensnared you again. It's frightening, it's vivid, it's mind-fuckery. There is a very fine line between reality and virtual reality. I repeat: you don't know what's real. Ness gives us characters with such depth, such diversity, and such humanity that our heart breaks and yearns for them. Their lives are shown to us starkly, realistically, yet tenderly, so that nothing but love could pour out for any of them. Our protagonist, Seth, and his two friends Regine and Tomasz, were just the most unlikely and gorgeous set of comrades. My heart swelled for all of them, but I doubt I'm alone when I say it swelled for Tomasz most of all. With everything going on in the world today, I would love for Ness to write, and for everyone to read, an entire story on Tomasz's life - whether it turned out to be real or not. I'll stop rambling now. After proof-reading what I've written so far, I'm unsure I've conveyed expertly what this book really was and how it made me feel. It's incredibly difficult to review; I believe it will mean something different to everyone. The best I can do is urge you to read it, and make your own mind up. Note: Please don't ask to borrow my copy; it's special.